Originally from Surrey and currently based in East London, Claire Ratinon is touching something very deep and true in regards to sustainability, self-action, responsibility, and awareness. Which is represented in her lifestyle and work with food and gardening. This silent hero has been hailed as one of the top garden Instagram accounts to follow by the likes of Vogue, The Guardian, Thompson & Morgan and The Telegraph, and for a reason. There is depth and meaning behind her posts, it’s not just your standard run of the mill Instagram gardening account. As she presents her thoughts and perspectives on a more sustainable way to interact with nature and food as human beings. You get a feeling that here is someone questioning, reaching out and getting in contact with projects, courses and organizations that reflect her queries and beliefs. And so we at The Green Conspiracy would like to present you with another one of these incredible humans. Who are working constantly to find ways to create more sustainable and responsible actions that support our natural world and food chain simultaneously. Her online presence gives the public a direct channel to her interactions with community and food growing. For instance, one post presents a beautiful picture of the natural forms honeycombs make in a ‘Warre’ hive when there are no frames, and bees are allowed to build the natural forms that suit them. Others show gardens she’s found and places she’s been volunteering or working with, or courses she’s taking to expand her horizons. In her posts she always presents or questions an aspect of nature, and our human interaction with it. Or alternatively and most refreshingly she clearly and honestly talks about her journey to better understand it. And it is in this questioning, exploring and creating of new perspectives around gardening, food and our relationship with nature that Claire effortlessly undertakes where we once again come into contact with a silent hero of our society. In a nutshell, Claire Ratinon is presenting in a very honest and down to earth manner the role that plants and food can have in our lives and what this can look like whilst ‘walking the talk’ so to say. Through the process of interviewing her, this feeling of depth behind what she’s querying has only grown. As it becomes apparent that she has found a clear connection with food growing and the magic that it can hold for people and transforming not only our society but ourselves. And this speaks to something, which I think all of us as gardeners and food growers of any sort can relate to. The power that the humbling activity of growing food and caring for a garden can have. It’s empowering to realize once again that we are not alone and that there is so much potential in urban areas for us to use our power and ability to question our interaction and step forward as responsible citizens. “I’m not one of those people who was gardening as a child, I discovered my love for the act of food growing well into adulthood and I don’t honestly know where it was hiding for nearly 30 years!” Originally upon finishing University, Claire went into working in television which led her to work in New York in documentary production… and this is where she discovered her love for plants and begun to head down the garden path so to say. Which has led to her becoming an urban organic gardener and a key representative for the movement on social media. “While I was living in New York and working as a producer, I came across a rooftop farm called Brooklyn Grange while I was out walking with a friend. High above a busy street in Queens, there’s over an acre of vegetables growing while overlooking the NYC skyline. I started spending more and more time there, volunteering to be involved however I could and it ignited a love for growing that had, until then, been limited to the houseplants in my apartment”. Realizing that she wanted to make growing a bigger part of her life she returned to London to see if this new dream could become a reality, and indeed it has for her. You can get a feeling from both her website and Instagram the in-depth contact she has with gardens, gardeners and green spaces in London that has made this dream of hers a reality. “I think plants and nature have an innate capacity to encourage us out of our ruminating thoughts and into the present moment. I’ve personally experienced how nourishing, healing and enlivening food growing can be and it is something I love to share with others”. This is essentially it, for there is such beauty and simplicity to be found in the work undertaken in a garden or small place such as a balcony or windowsill in the pursuit of growing food or plants. It brings us into the present moment and space where growth and action are taking place very slowly and building into something bigger. Becoming a flower, salad head or perhaps a tomato. It’s in that instant of work, be it clearing, weeding, altering or caring for a plant or natural space, that we become part of that moment in which growth is taking place in time. And I don’t know about you, but I’ve heard this described by many gardeners as a timeless space that gardening and food growing can take us into, similar to meditation. This is where, I personally think that so many people are beginning to find solace in gardening and food growing. As this interaction with nature is calming, mindful and for some meditative. There is definitely a reason that the Japanese practice of ‘forest bathing’ has been found to lower blood pressure and heart rates, reduce stress production and improve our overall well being as humans. And gardening or urban food growing definitely has the same effects, as Claire has so beautifully highlighted. When we asked Claire what and how she feels that her work has instigated change, we got a slightly unusual answer. A beautiful one without a doubt, but not one we usually hear. For when people are asked this question they usually tend to answer what difference their work is making in other people’s lives, organizations or in nature. In other words, how they are impacting and changing the outside world with their work. But Claire answered that she has found that the main thing transforming through her work is actually herself. This in turn she claims is creating an increased awareness of how her life interacts with and impacts the world around her. Essentially Claire has found that her work has totally transformed how she is in work, what she consumes, how she interacts with people and what she uses and refuses. The work has finely tuned her sense of responsibility and presence in the world. How her actions and reactions shape and make and contribute to the world around her. It appears that people who take on this sort of work, and these sorts of career changes do tend to have awareness about how their actions and reactions make and shape the world around them. And this in itself is what creates a ‘silent hero’ persona. People who aim to impact and change the world through their work. Even if it is growing one lettuce at a time, or helping others to learn how to grow food. This can be so rewarding and enriching. For us here at The Green Conspiracy this is what resonates. Some people would describe this path as walking ‘the high road’, or the road less traveled. Where you are aiming for more, but it also comes with increased challenges. For it is a bit like opening a door through which once you’ve seen what’s on the other side you can never forget. But honestly, when considering all that is going on (and perhaps wrong) with the world today, why wouldn’t we want to open that door and step into becoming responsible citizens if we have the opportunity? And one of the best places to start and pursue is that of our food and what it is that we buy, consume, and therefore support. And the act of growing our own food brings us one step closer to closing the loop. We asked Claire what she feels needs to happen in the food growing and gardening industry to see positive change on a much wider scale. She found this question tough, “ the issues that have created the problems in our food system are complex and wide-ranging so no one thing, nor a handful of things can address the many reasons it is broken. But I do believe that one of the simplest, most powerful things that we can do as individuals, as communities, for children is to learn a little about what it takes to grow food by learning the process. It is an empowering yet humbling journey to see what it takes to watch a seed become a plant and see it turn into something that you can eat. By showing us how much energy, effort and time goes into bringing us the food that nourishes us daily, we can truly experience gratitude and reverence for the people, animals, and plants that make it possible for us to eat”. She feels that if we can connect with the systems that feed us more, then we can also see the parts of this system that result in “chronic waste, environmental degradation and pollution, low pay for farmers and all manner of suffering – and we can choose not to support it with our money and our bellies.” This concept of food citizenship or voting with one’s fork is so powerful if you consider that we ourselves uphold and support the agriculture systems in place with our purchase. But more importantly, we can also bypass this system by producing some of our own food. “The system is complicated and there’s a lot we don’t see and can’t know but I do think the simple act of growing your own food – even just one tomato plant – can be the push a person needs to start thinking about the food they put in their mouth and commit to being more aware of how it got there”. And of course- one of the ways in which she keeps her eye on what other growers are up to is finding inspiration on Instagram, as she says that she finds it so image focused and easy to engage with. “It’s interesting to see what’s worked for other gardeners and what hasn’t and there’s a lot of lovely supportive people out there so it’s a good way to connect. Plus in the darkness of winter, it’s easy to find pictures of what’s growing on the other side of the world – which is a reminder that spring will come back around before you know it”. From market gardening to urban permaculture projects, Natasha has been involved in a multitude of projects linked with food growing and sustainability, for over 12 years. Originally from South Africa, she has gained her experience in sustainable food production through hands-on work worldwide. 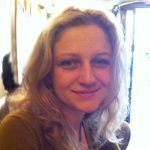 She is currently based in Berlin, assisting a few projects, whilst completing an MSc in Horticultural Science. Meet Brie Arthur, the coolest plant lady!